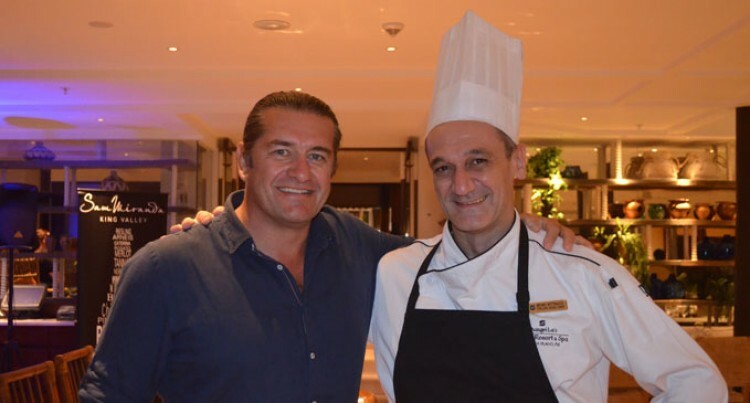 Sam Miranda of Sam Miranda wines with Sous Chef Bruno Bettinnaz at Shangri-La’s Fijian Resort and Spa on June 1, 2018. Wine pairing plays an important role in any culinary industry. Those were the words of Shangri-La’s Fijian Resort and Spa’s general manager Francis Lee during the Sam Miranda wine and dinner event at the resort on Friday. The event drew guests and stakeholders to the resort’s newly-revamped Golden Cowrie Coastal Italian restaurant. Also present were the importers and distributors of Sam Miranda wines, Law Hill Wines and Spirits. It was a “romantic” evening of a culinary five-course food journey, served with five varying types of wine made by Sam Miranda, an eminent Australian wine-maker. Mr Miranda comes from a long-established wine making family with Italian origins. He runs his own successful winery and vineyards in Victoria’s wine producing region of King Valley. Mr Lee said the main objective of the event was to showcase the resort’s culinary food journey and wines for in-house guests. “Having Sam Miranda’s wine company on board is a logical way forward for any culinary business,” said Mr Lee. Mr Lee said the resort is fortunate to have a partnership with Sam Miranda since 2017 and through it, the resort’s business has continued to grow. “We selected Golden Cowrie restaurant as an ideal location to host the event because it was a good opportunity for our guests to experience what we can offer, especially for special occasions like honey moons, engagements, marriage and anniversaries,” he said. 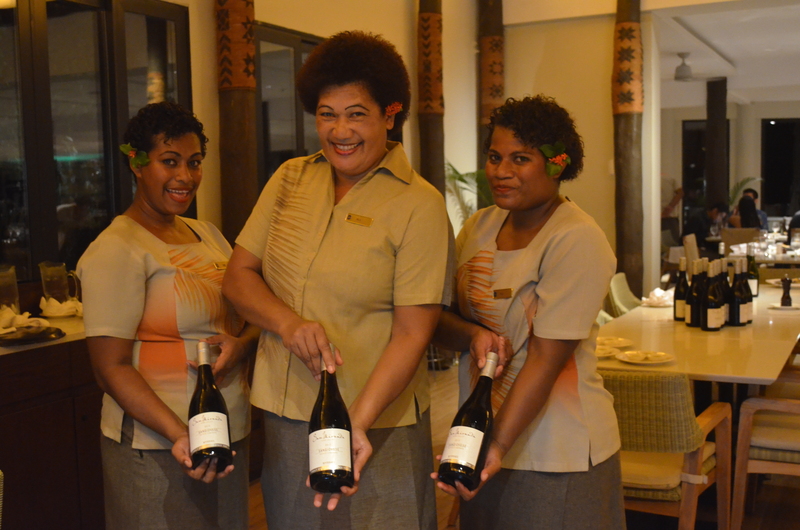 Staff of Shangri-La’s Fijian Resort and Spa Golden Cowrie Coastal Italian Restaurant present Sam Miranda wines on June 1, 2018. “The climate in here (restaurant) suits our wines,” Mr Miranda said. Resort executive chef Rudolf Kunkel said Sam Miranda wine’s natural and appealing taste gelled well with the restaurant’s menu. “It is very challenging to pair wine and food and it needs a lot of task in testing and experimenting the wines statue in order to have perfect match with food displayed,” he said.